Why does Santa have three gardens…..so he can Ho Ho Ho!! Why does Santa’s helper see the doctor…..Because he has a low elf esteem!! Who is the king of Santa's rock and roll helpers?......Elfis!......Thank you, thank you very much!! Performance of the day came from Discovery Bay who demolished Krauts 6-0. In a game they largely dominated from start to finish they had a hat-trick from Jordon Brown with solitary goals coming from, David Rollinson, an Own Goal and Chris “I’ve enjoyed Christmas a bit too much” Ingham. HK Scottish ran out 2-1 winners against Mes with strikes from Aaron Tennant and Myles Winter taking the 3 points in a good physical tussle with Lar Finnerty getting on the scoresheet for Mes. J-Leaguers put 4 past San P’s while keeping a clean sheet with James Nortey netting a race and additional goals via Chris De Laglesia and Tomoo Onodera. “Good fight San P’s” is all I got for this game……sounds a cracker!! The 4th game of the weekend was a much tighter affair with Corinthians and Tropics locking horns at Tsang Tai Uk (Sha Tin). After finally managing to bypass the bulldozer of a pitch attendant the teams largely cancelled each other out with Cors playing to their long ball strengths and Tropics not getting anything going across midfield or up top. Cors however were looking the more lively closing Tropics down quickly and forcing mistakes and it was from a mistake that the only goal of the game came from. After receiving the ball from a throw in a misguided pass tween the two CB of Tropics allowed Cors through and Jamie Hitchmough made no mistake scoring around 20 minutes into the game. There were very little chances for the remainder of the game with both teams cancelling each other out but no complaints from Tropics with the result. With Corinthians having a game in hand there is the potential for only 3 points to separate 5th and 11th in the league so it will be an interesting 2nd half of the season with many closely matched team. In Division 2, we saw a good chunk of goals for the celebration of the new year. Not surprising to see a score of 8-2 in a Vikings match but this time it was the leaders who fell to victims. Legal head pulled off a remarkable and memorable victory relying on a hat-trick from veteran scorer Amin Ashraf, a brace from Adrian Matuszewski and Michael Frank, and also a single from Gurung Misal. “Must have not been eating as many pies over the break as the opponents – or just got up early in the morning, or finally a KO time to suit,” commented Douglas Simmons, manager of Legal Head. Kasper, manager of Vikings however got different view. “We will try with a proper keeper next time.” Both Vikings’ goals were scored by Lars Nielsen. 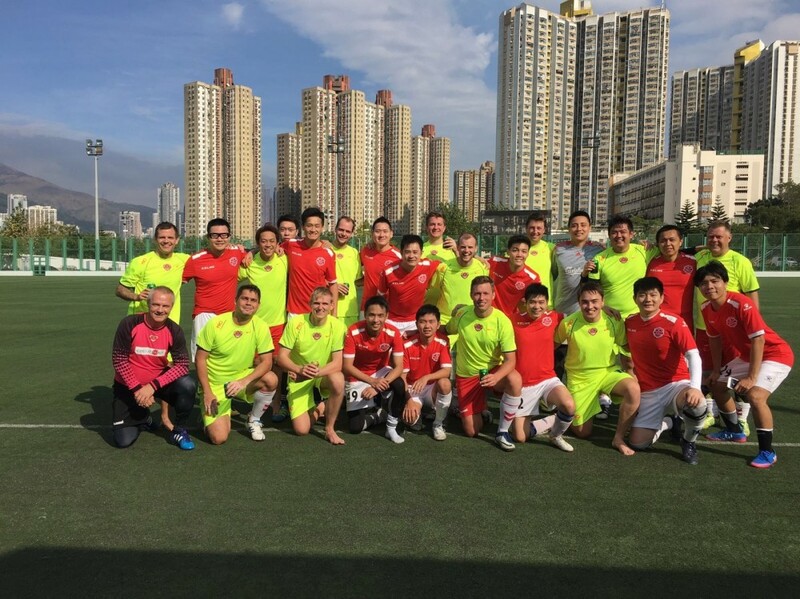 A hat-trick from Soho’s top scorer Li Youngsen, a brace each from Charlie Toller and Robbie Lunn and also a goal from Jim Porteous sealed their remarkable 8-2 victory over Team Shotgun. “Soft defensive mistakes from us cost us at least 3-4 goals.” Said their manager Bert. Tim Leung and Sean Ko were their goal-scorers, while Chester Yuen was sent off. Bants proved too strong for BOC. Lee Hodgeson hit the target for 3 times while Sam Ameen also found the net twice and Alexis Devaud once to record this 6-2 win. Mohamd Lemsitef’s brace restored some pride for BOC. Young Guns broke the winning streak of TWF with a 5-2 victory. Their pace killed off the TWF defence who had Albert Tong score an hat-trick and Dave Tse and Nicky Lo add one each. Worth to mention the goal from Dave which was a spectacular volley from out of the box which hit the top of the right hand corner of the net. Great goal! Fung Chan was on target twice for TWF whose first goal once put them back to the game at 1-2 at half time but they didn’t take their chances well in second half and a defensive mistake put them down to 1-3 and game was put into the refrigerator. Revolution beat Shui Wei 2-1 in a very competitive and hard-fought game. Chris Marshall and Dave Jessop were the scorers for Revo while Ernesto Tovar did the damage for Shui Wei. Elsewhere Rob Croucher scored a brace to help to lift Old Speckled Men to a 2-0 victory over Shooters, which was their second of the season. On Monday night, it was again showtime for the two KCC teams. Royals showed no mercy to bottom team MBFC. Sam Trayford was the hat-trick hero while Dan Jacques and Tim Moreno both delivered a brace. Jon McKinley also put his game on the scoresheet to mark this 8-0 win. Cavaliers also recorded a victory in the night but in a much difficult way. Halfway through the second half when everyone thought it should be a goal-less draw, a well worked team goal gave them a 1-0 lead which they hanged on to a hard-fought victory .